A 2009 report by the National Highway Traffic Safety Administration showed that one in five car accidents were the result of a distracted driver, and as many as 16 percent of all car-accident deaths were also related. This statistic is tragic as many of those deaths could have been avoided. The world is a very distracting place, and the amount of possible distractions seems to be constantly on the rise. No longer are crying babies, spilled coffee and interesting roadside spectacles the only things that can draw your eyes away from the road. There are now smart phones, social media updates, in-car entertainment systems and GPS navigators as well. Being aware of the major driving distractions can help you do your best to avoid them. It may not seem like grabbing a quick snack is distracting, but if you have to take your eyes away from the road to do so, you’re putting yourself and others in danger. If you have an easily accessible snack that you can grab and eat without looking away from the road, go ahead and do so. However, if you have to dig around in your glove box, open a wrapper, put in a straw or otherwise use your hands, wait until you can stop or have a friend do it for you. Passengers have a lot of potential to distract you as a driver. They ask you questions, point to things alongside the road and encourage you to look at them without even meaning to. As the driver, it’s your job to ignore your passengers if you think interacting with them will cause you problems. Regular chit-chat is fine, but avoid getting into heavy discussions, taking part in horseplay or responding to any demands that you look at something. 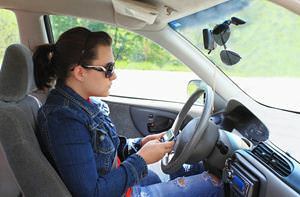 Cell phones are the leading cause of distracted driving. Research conducted at the University of Utah showed that cell phones can affect a driver as much as being moderately drunk. Taking your eyes off the road for even a few seconds can easily result in a crash, and it takes the average cell phone user as long as four seconds to send a text. In four seconds, your car could travel the length of a football field. Clearly, the only way to protect yourself is to refuse to use your phone while driving. If you don’t feel that you have enough self-control do to this, put your phone in a place you can’t reach it. Don’t worry about your messages. They will be waiting for you when you arrive. Most of the time, you can change your radio station or put in a CD without taking your eyes off the road. However, it only takes one mistake to cause an accident that could change your life forever. This isn’t to say that you can’t touch your radio, but if you have to do something that requires eyesight, wait until you are stopped at a light. A GPS is a wonderful tool, but it won’t serve you very well if it distracts you enough to cause an accident. If you need your GPS to guide you somewhere, be sure to set it up before you leave rather than punching in your destination when you’re halfway there. If all else fails, pull into a parking lot and figure out where you’re going.